Quarterly publication revisits an equally colorful 1964 British invasion by Freddie and the Seamers. 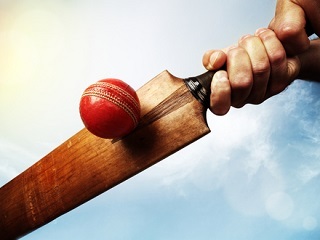 The Nighwatchman, a quarterly publication about the sport of cricket, debuted in 2013. In the current Spring 2015 issue, there is a wonderful piece by journalist and author Dan Waddell about the other British invasion of America in 1964. The one involving Yorkshire County Cricket Club squad Freddie and the Seamers. The crowds for both matches were unspectacular, in particular the second at Downing Stadium on Randall’s Island, which could hold 22,000 people but contained only a few hundred, mostly West Indians. Might this have been because, on the other side of the East River, The Beatles were playing the final gig of their second U.S. tour that year? More than 100,000 hysterical fans had gathered during the day outside the Paramount Theatre on 43rd and Broadway, while a lucky 3,622 were crammed inside. The Beatles did not take the stage until 10.45 p.m., so the Yorkshiremen would have been able to make the concert after play. Alas, no one had had the foresight to put them on the guest list. The Seamers, after a quick non-playing return to NYC, closed out their epic bit of cricket diplomacy with some matches (and fun in the sun) in Bermuda. Thanks in part to a locally recruited ringer, Garry Sobers, the team stayed undefeated on this side of the pond.